Consider–my world 1952 to 1959. Thoughts on the origins of belief. Here was my world from 1952 to 1955-6: Vermont Street Sutherland, NSW. And here I am in that world, towards the end of the period. 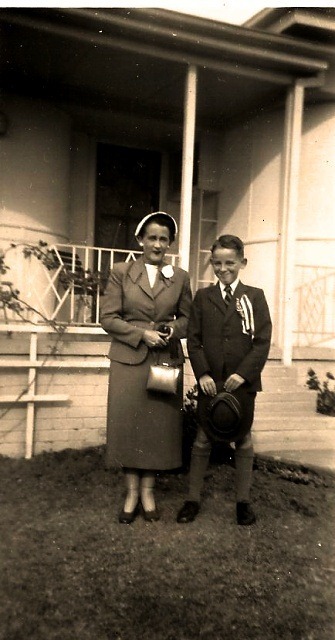 That is April 1955 and I am in the front yard of 1 Vermont Street with my mother. I am 11 years old, and newly at Sydney Boys High. I had had a serious illness just three or four months before – pancreatitis – so I may look a touch thin still. All the ribbons are because we are going to the GPS Regatta at Penrith, a big deal in those days and perhaps even more so in my family. I was the first in the family entitled to go as I was in a GPS school – albeit the only state-owned one – as I would later be the first in the family to go to university. Just three years earlier my sister had died – 61 years ago today. She was cremated and her urn placed in a rose garden at Woronora Cemetery, which she now shares with Grandma and Grandpa Christison, who died in 1959 and 1963 respectively. And that takes me to the subject of belief, because my sister’s death affected me very profoundly – of course this was just as true for the rest of my family and extended family, but it is of myself I think now as I sit in the last six months of my seventh decade. Read my mother’s account in her own words. My immediate family were not religious, or perhaps more accurately were not church-goers. The poets and Charles Dickens – she acquired a love for both from her father – were the formulae of her faith, rather than The Bible which she rarely read. And my father? Very much impressed by the writings of Colonel Ingersoll, among others. Indeed it was from my father that I first heard the name. But his agnosticism – for such it was – combined with a respect for the ethics of Christianity and for much the churches did, though he, nominally an Anglican, did not really want to have much to do with them. He had seen, it appears, fanaticism in some of his family’s past – though he rarely talked about that or them. He did quote this back at me, though, when after around 1958-9 I became perhaps obnoxiously religious. I came like water, and like water, and like wind I go. And my Grandfather Christison, though the son of a woman of faith for whom he had enormous love and respect, was also truly an agnostic, at least as far as the institution of the church and the Holy Scriptures were concerned. He loved his Dickens. “…while I clean my boots keep a eye upon your mother now and then, and if you see any signs of more flopping, give me a call. For, I tell you," here he addressed his wife once more, "I won’t be gone agin, in this manner. I am as rickety as a hackney-coach, I’m as sleepy as laudanum, my lines is strained to that degree that I shouldn’t know, if it wasn’t for the pain in ’em, which was me and which somebody else, yet I’m none the better for it in pocket; and it’s my suspicion that you’ve been at it from morning to night to prevent me from being the better for it in pocket, and I won’t put up with it, Aggerawayter, and what do you say now!" Growling, in addition, such phrases as "Ah! yes! You’re religious, too. You wouldn’t put yourself in opposition to the interests of your husband and child, would you? Not you!" and throwing off other sarcastic sparks from the whirling grindstone of his indignation, Mr. Cruncher betook himself to his boot-cleaning and his general preparation for business. I went to Church/Christian Endeavour/Sunday School probably no more times than can be counted on the fingers between 1950 and 1956. But that changed markedly, especially after 1959. As I mentioned in the previous “Consider” post my views in the early fifties derived from the books my mother had bought from some passing Seventh Day Adventist colporteur. What I do remember is that I sought comfort as I grieved for my sister in the years 1952 and 1953 in religious rituals of my own, such as arranging crosses of pebbles in various parts of the garden, something my parents were totally unaware of. And I pondered the images of the next life and the resurrection of the body on those SDA “Uncle Arthur” books. I also often had dreams and nightmares about death. In one I recall there was a skeleton by my bed, as vivid as can be. This entry was posted in faith, family, memory, personal, The Shire. Bookmark the permalink.